We are interested in how the brain processes sensory information. To understand this we focus on the computations performed by neural circuits in the sensory pathway. We have two general questions: What computations are performed and how does biology solve these computations. 1. They receive an input, this can be from a different neural circuit or directly from receptor neurons. 2. They are composed of a group of neurons forming synapses (connections) with one another. The building blocks of any computation involve operators, e.g. arithmetic or logical operators. 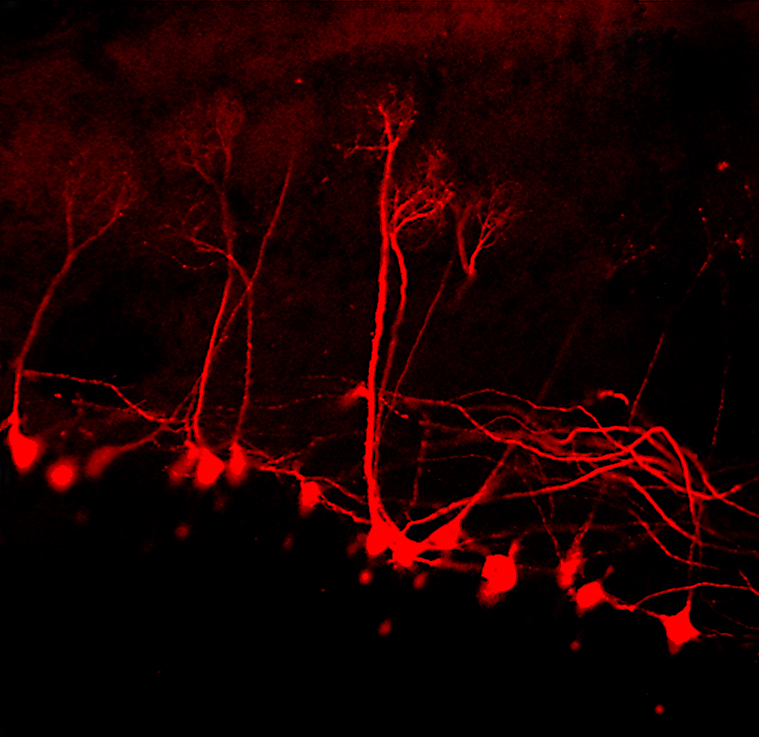 Single neurons can perform all of these operations on their synaptic inputs. They can achieve this via different mechanisms, an example is illustrated in the figure below, showing that the particular arrangement of excitatory and inhibitory synapses can generate different logic gates. Very simple arrangements of neurons can implement signal processing algorithms, for example, the simple circuit shown below acts as a high-pass filter with automatic gain control. 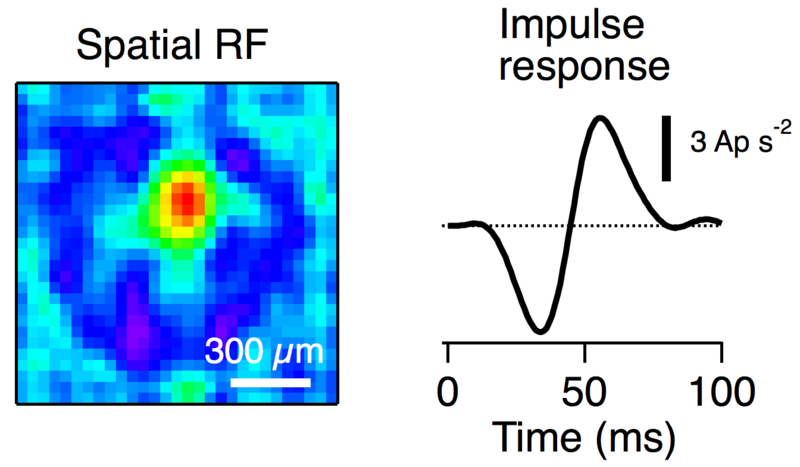 When a new input signal arrives both the excitatory and inhibitory neurons become active, but the excitatory neuron will only respond to the stimulus onset as it is subsequently suppressed by the inhibitory neuron (Feedforward inhibition). 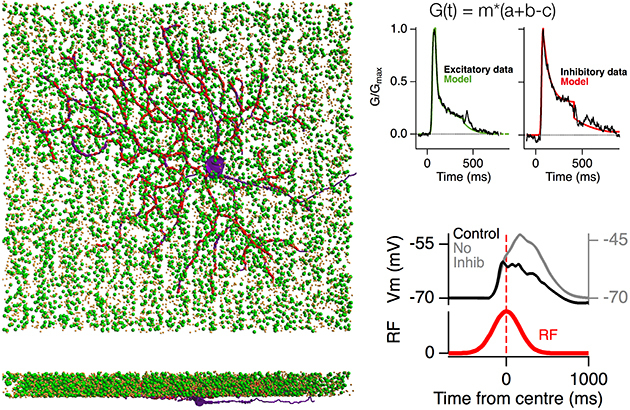 The activity of the inhibitory neuron also reduces the size of subsequent inputs (Feedback inhibition). Our sensory pathways are provided with only rudimentary information from the receptor neurons that sense our environment. For example, a photoreceptor can only signal the light intensity at a particular point in space. From this basic information, the neural circuitry of the eye is able to compute many complex features of our visual world, such as the orientation of edges, the direction of moving objects and their colour, as well as allowing this circuit to work over light intensities spanning 9 orders of magnitude. These and many other computations all occur within the retina before any information is sent to higher areas of the brain. 1. To understand what higher areas of the brain are doing we need to know what information is being sent there, i.e. what computations have occurred in the earlier circuits? 2. Neural circuits have solved a range of computations that are relevant for artificial intelligence, such as image analysis and pattern recognition. How are these computations implemented by the neural circuitry? The task faced by our sense of smell is to recognise and classify odours. Odour molecules activate different patterns of olfactory receptor neurons and from these different neural patterns, our brain can classify the molecules shown below as either vinegar or vomit. How is this achieved? 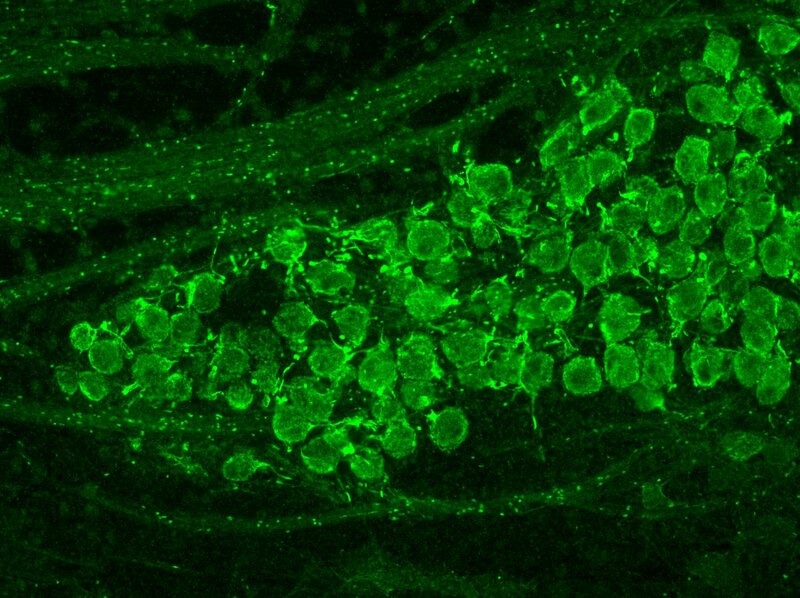 The olfactory bulb is the first neural circuit in the olfactory system, we are interested how this circuit contributes to the recognition and learning of odours. How is the pattern of receptor neuron activity encoded by the output neurons of the olfactory bulb? What changes in the neural circuitry occur during learning of new odours?